Zalons are strange creatures that roam the western forest, from the cold lands near the Arkene to the edge of the desert. Unlike other companions, the two varieties of zalon cannot stand each other, and guard their lands viciously. In The Keep there exists an uneasy truce between the two, and many fights break out that must be quelled. The hatred between the two is easily understood by their appearances; one is a friendly looking animal, with tan skin and feathered wings. Dark zalons are as different in form as they are in nature: darker, snarling beasts with webbed wings resembling those of a bat. If not for these wings, one may assume them to be normal dogs. It is these powerful wings that allow them to hunt both the ground and the sky, where they can easily view the land for miles. Nothing tracks better than a winged canine. 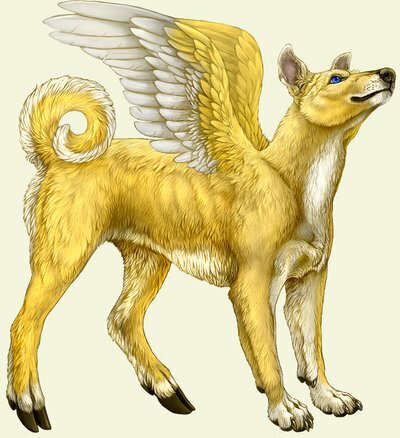 They are capable of searching both from the air and by scent on the ground, a unique skill that once made them common companions of dark magi. These legendary hunters would travel in packs, searching relentlessly for their prey, be it animal or human. With only a handful of dark magi remaining, zalon companions now reside at The Keep, where they make themselves useful by helping to guard the land. These canines are full of energy, constantly pacing the ground or sweeping the sky, even during the colder months. In the dead of winter, their innate magics help keep them warm, and their mere presence warns off potential threats. A fiercely wagging tail protrudes from this egg. A zalon pup is nothing more than a bundle of energy, constantly at play. As these younglings learn to fly, they claim the sky around The Keep as theirs, noisily making games out of hunting one another. Zalons are known to possess great fighting skills, making it important for a magi to establish boundaries. Because they are born rather small, and act like puppies, it is difficult to remember that they are dangerous beasts. A small nibble from a hatchling could be a very painful bite from an adult, and a magi must take precaution to train their zalon companions. Failure to do so results in an uncontrollable animal who must be sent back into the wild. As a zalon ages, it becomes increasingly obvious that they are not normal dogs. In place of paws, their back feet have hoofs, and wings jutting from their shoulders also set them apart. The only tales of them are very old and vague, as some of the more ancient texts have fallen apart or are impossible to translate. The legends say that as a zalon grows older, they will often leave their homes, sometimes for months at a time. It is said that zalons are separated into two kinds, the light being kind animals who defend the deserving. Dark zalons, on the other hand, are cruel creatures, seeking to lead travelers into dangerous lands. The only other information known is that all who attempt to defeat a dark zalon have failed. It's amazing that one of their eggs was ever found and brought back to the castle. These days, magi receive zalon eggs from those zalons already residing at The Keep. Given their past, it's understandable that zalons are difficult creatures to tame. If one works hard enough, a light zalon will become a valuable friend, defending their human companions to the death. Dark zalons, despite however much time a magi trains them, always tend to be more aloof and prone to violence. When a hatchling grows old enough, it is best to introduce them to the forest, where they can prowl the day away without harming anyone. One must be careful, though – zalons are impossible to track down if they do not wish to be found. A mistreated or discontent zalon will disappear into the woods, never to be seen again.